On your mark, get set, ride! Join the second season of the Tour de Timbers and enjoy beautiful Colorado with a bike trip from One Steamboat Place to The Sebastian - Vail – offered once a month this summer from June through August. Led by Venture Sports, “the friendliest ski and bike shop in Colorado” and Timbers Resorts ambassadors, the Tour de Timbers offers a biking experience like none other. Options are to leave from One Steamboat Place and ride to The Sebastian - Vail for a 91-mile route or, for a shorter version around 60 miles, leave from Steamboat's Catamount Lake, and end in Wolcott at the Yacht Club. For those who choose the full distance to Vail, you’ll have the option to hop a ride in the support van back to One Steamboat Place or stay the night at Vail's finest private residence club, Residences at The Sebastian, for preferred rates. Either way, you'll be experiencing the best of what both Colorado luxury resorts have to offer. 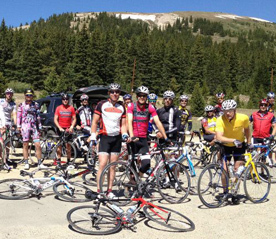 To take part in the monthly ride, it's just $40 per person, which includes Venture Sports' SAG wagon support, snacks, and transportation back to Steamboat. Demo bike rentals can be arranged through Venture Sports as well. Post-ride, soothe your muscles with a special $91 “91-Mile Treatment” at The Sebastian’s Bloom Spa. During this firm and nurturing massage, your feet are exfoliated then slathered with a soothing balm and snuggled into warm booties. Once your feet are warm and relaxed the therapist will massage away any remaining tension. If you opt to return to Steamboat instead, The Spa at One Steamboat Place offers a special 50-minute massage for $98. To register or for more information, please contact One Steamboat Place's reservations team at reservations@onesteamboatplace.com or 970.870.5100.